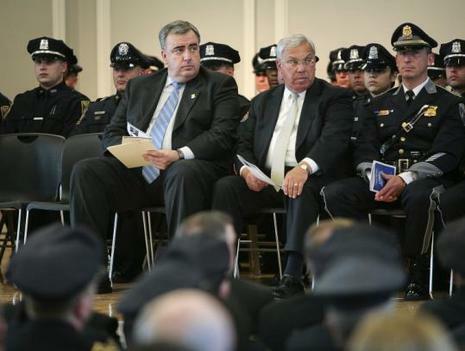 As the organization representing minority police officers in Boston ramps up its attack on Mayor Thomas M. Menino, leaders say they have been warned by insiders in the mayor’s campaign to tone down their rhetoric or their members will face negative consequences. It was this alleged threat, in part, that motivated more than 60 members of the Massachusetts Association of Minority Law Enforcement Officers to cast a vote of no confidence against Menino Saturday, said Larry Ellison, president of the organization. Ellison, a detective in the department who recently took over as president of the officers’ organization, has become more vocal about diversity in the upper ranks as the race between Menino and City Councilor at Large Michael F. Flaherty Jr. has heated up. Last week, he and some of his members stood in Grove Hall during afternoon and morning rush hours, holding signs calling for change in City Hall. Yesterday, they were in Mattapan Square doing the same. Ellison said the members who voted Saturday voted unanimously, but the final tally did not represent the total number of officers in the organization, which has 300 to 325 members. The vote came several days after Ellison, Menino, and Boston Police Commissioner Edward F. Davis met for dinner at a North End restaurant. Over plates of haddock, the three men discussed issues that Ellison said minority officers have complained about for years. Davis said that after that meeting, a black sergeant was promoted to sergeant detective and a Hispanic lieutenant was promoted to lieutenant detective. Three black sergeant detectives were moved to the domestic violence unit and the districts covering Dorchester and the South End, three areas where Ellison’s organization believes there should be more minority supervisors. “I thought that the moves we had made at their urging were a step in the right direction,’’ Davis said. He said he has spoken with other members of Ellison’s organization who are upset by the vote and disagree with it. “I’m surprised really that they’ve taken the action that they’ve taken,’’ Davis said. Ellison said that Davis and Menino, during their Tuesday dinner meeting, did not attempt to dissuade him from canceling his organization’s planned pickets against the mayor. But on Thursday, Ellison said, Menino campaign insiders approached leaders of his organization, telling them it would be difficult to negotiate higher positions for minority officers if the opposition continued. A group representing Boston's minority police officers is making waves in this year’s mayoral race, slamming Mayor Thomas M. Menino and Commissioner Edward F. Davis for what it believes is a failure to diversify the upper ranks of the department. Over the weekend, more than 60 members took a no-confidence vote against Menino, according to Larry Ellison, a Boston police detective and president of the Massachusetts Association of Minority Law Enforcement Officers. Ellison made his remarks to reporters gathered outside the Boston School Committee building on Court Street.